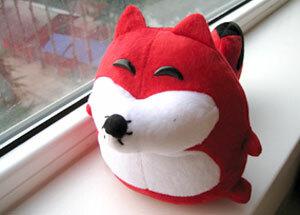 The Chinglish Files by olr: Thanks for the fox. This morning I had an hour-long interview with the news people from sohu.com at their headquarters in Zhongguancun. 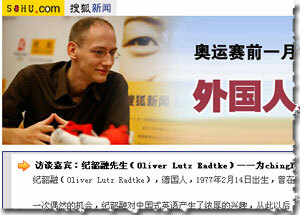 Many thanks, 廖恒 and crew, for taking such an interest in this matter! Another great thing about coming to sohu.com is: after all the talking you get to bring a new friend home! yeah, i have read the news from the sohu.com. What i wanna say is u r a handsome man and gud luck. Why not call it lili? cause fox is pronounced hu li in chinese. Habe das Interview ganz kurz angeguckt, muss ich sagen, dass Dein Chinesisch prima ist! Dachte dann danach, wie ich Deutsch ohne Akzent aussprechen könnte? Durch solche Vollstellung könnten die Chinesen Deine Meinung vielleicht besser verstehen. Call the Fox like the website. Chinglish is quite a cute name and if it's about this website just associate it with it. I must say it's a little bit of a embarrasment if you think about it. As they already said, China will only be popular due to their english pronounciation AND their bad translation. Nothing to do with Olympics what so ever!! I just hope that the Government and the People feel the same way and do everything in their power to change that. All the Best to the Olympics AND China. BTW GERMANY YOU ROCK (LOVE YA GUYS)!! the name of these foxes are called Huhu. it comes from the pronounciation of hu2 狐of fox 狐狸 in Chinese. I live in Melbourne now and I call my English "Chinglish". My friends and colleagues do enjoy my Chinglish thou and it has become part of me. So, why not? if Lili is a good name for girl case, why not take Huhu for boy? Many thanks for the baptizing suggestions insofar! "Huhu", indeed, sounds like a mockery of Brother Hu, we don't wanna go there. "Lili" is a great one, if one decides that this fox is female. Naming the rascal "Chinglish" is bizarre. I like it. All in all great ideas, keep 'em coming. As a native Chinese speaker(I live in Taiwan..), I really appreciate your effort in helping us improve our English ability...but I think you really needn't praise Chinglish so highly. Call it sweetie,no matter what its gender is.